APLS Body Guard Bio is a disposable, highly absorbent body bag that minimizes the spread of bacteria and viruses while protecting service providers and the deceased. The bag's highly absorbent core features an anti-microbial to control pathogens and contain odors while containing over four liters of bodily fluids. An external nylon shell, watertight zipper, thermal seals and finished edges create a leak-proof inner chamber that contains contaminated blood and bodily fluids. Extreme environmental conditions or repeated external decontamination do not affect the bag's ability to minimize the spread of bacteria and viruses, thus protecting service providers. Lightweight yet rugged, APLS Body Guard Bio is designed to work independently or with a stretcher for staging, storing, and transporting contaminated remains. The APLS Family of Products has been expertly engineered to fit the needs of injured personnel in military and mass casualty environments. 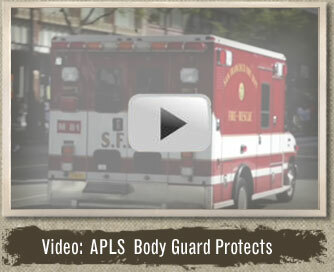 Each of the APLS features serves a unique purpose in safely transporting victims. Photo Courtesy of U.S. Army by Maj. Gregg Tooley.